Map showing the main ports and estuaries the Mediterranean sea. The river Saone joins the Rhone in the city of Lyon. 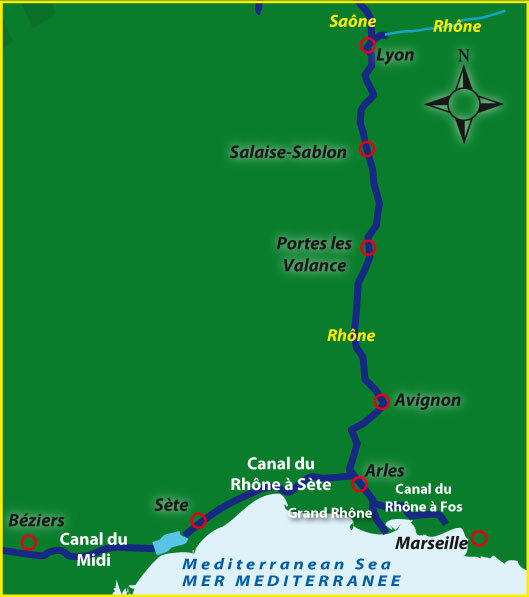 The Rhone then flows south to the Mediterranean sea. Just before Arles the Canal du Rhone to Sete follows the coast line to the west and connect to the Canal du Midi. The Canal du Midi continues to the west, below the Pyrennees mountains and providing a route to the Atlantic cost via Bordeaux.